6 different sites for the Calendar – Dopplr, Upcoming, Remember The Milk and fbcal feeding into Google Apps Calendar. Nuevasync syncs a subset of my Google Apps Calendar to my Samsung i600 phone. Remember The Milk feeds into my Google Apps email. I use Google Calendar Sync for my desktop calendar that lives in Outlook 2007. I had a sync setup between my phone and Outlook as well, but stopped using that after some significant grief. I sync my Google Apps mail via IMAP on my phone and backup using POP3 in Outlook 2007. 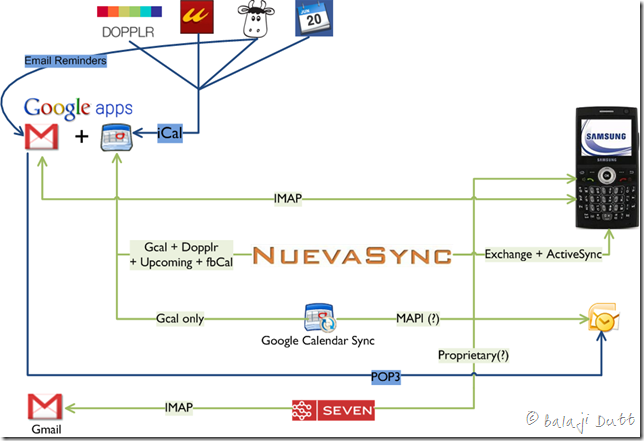 Regular Gmail is synced via IMAP and some magic sauce using Seven. It probably has too many moving parts and is overly dependent on various free services. But it works well enough for me. One Response to "This is what a hacked together push solution looks like"